This Flo-n-Gro® system comes complete with a 55 gallon food grade reservoir, twelve (12) 4 gallon grow sites and twelve (12) 3 gallon 360 degree mesh aeration inserts. These mesh inserts promote lateral root growth and better aeration for the root zone. 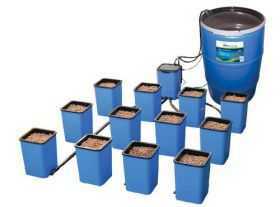 The complete system features Titan Controls® Oceanus® 1 - Flo-n-Gro® controller. The kit includes tubing and fittings to hook up the system. The 3/4 in fill lines improve water exchange and flow rates and two (2) dependable pumps. 125 liters of grow media (not included) will properly fill the 12 gro sites. Easy to use and simple to understand, you can set up the complete system and be growing in one hour! When fully flooded with water the Ebb & Flow takes approximately 1.95 gallons of water per plant site (may vary with media). 120 Volts/60 Hz. Patent No 9,176,503. BPA free.